Thats amazing Ron. They mustve been having a good look at you guys. Thanks Ron. I will have to get my act together and come out with you guys sometime. I have to admit im a bit wary of the hairy! I must say I had not been reading this thread. But this comment caught my eye. I have never seen a Bush Ape. Neither have I ever experienced this "rock/pebble throwing" activity. I would very much like to know how many people who report this have actually seen the Bush Ape throw the rock? 1) Extreme accuracy of the projectiles. 2) Projectiles some times falling "vertically". all seem to be eerily similar to well-documented reports of poltergeist activity. In fact, if nobody has ACTUALLY SEEN a Bush Ape in the vicinity then that is what I would suspect is going on. I'd be interested to receive comment on this suggestion. Let me assure you it is quite astonishing you hear rocks coming through the trees but cannot see where they came from.We were sitting in the carpark one night and huxley was standing in front of me and I just happened to look down at his feet and a small rock the size of a golf ball hit him in the leg. Now it would of had to be throw from at least 20yds to hit him and yet nothing was there but we certainly had the feeling there was though. The area is certainly an excellent habitat for these animals. Plenty of water and I reckon the dam would have more than enough tucker around its edges in the form of fresh water mussels, fish, yabbies and lilies. Please don't flood it with 'researchers' on a regular basis though... they are obviously not overly pleased with your presence and may resort to more aggressive behaviour... or even worse, leave the area completely. In fact it's a shame the location is 'on the record' in this forum. Maybe Dean could remove the posts that reference the specific area? My ten cents for what it's worth... Perhaps refrain from using torches so much and enter the area with respect like the Origines do by verbally letting the 'Old Fellas' know you mean no harm nor disrespect. And just what language do you suggest is used? Any one of a hundred different Aboriginal dialects? English? Croatian? Greek? Or are Bush Apes fluent in several different dialects? I had no idea they were such accomplished linguists. Your comments are usually very good, Wolf, but I think this one is a bit below your usual standard. ronstar1 wrote: Let me assure you it is quite astonishing you hear rocks coming through the trees but cannot see where they came from.We were sitting in the carpark one night and huxley was standing in front of me and I just happened to look down at his feet and a small rock the size of a golf ball hit him in the leg. Now it would of had to be throw from at least 20yds to hit him and yet nothing was there but we certainly had the feeling there was though. So, can you clarify: no one has actually seen a Bush Ape pick up a rock/pebble, take aim and throw it? If not, that casts doubt on the theory that they are, in fact, responsible. As I wrote in the post yesterday, small pebbles and other objects being "thrown" (sometimes in a bizarre manner) is a hallmark of paranormal activity and no one yet has an explanation for it. By "bizarre manner" I mean things like pebbles descending vertically (as if materialising in mid air), pebbles flying very slowly through the air, pebbles flying horizontally, striking a person, but with almost no force, then falling to the ground, even pebbles turning corners in mid-flight. It is fascinating reading, but of course has not yet been explained in any rational way. Some interesting and relevant questions. Yes so would I, however, that is in all probability a very rare occurrence. I don't know of anyone that has seen them throw a rock. The closest would probably be the NAWAC team who through sheer numbers were able to have boots on ground in weekly shifts for more than 6 months per year for 4 years in their research area. While the shack was peppered with thousands of rocks during that time there is only a very few mentions of "seeing" an arm come out from behind a tree to do the rock tossing. I think it might be an unreasonable expectation to expect someone to witness that event in rainforest at night. That doesn't answer the question of who is throwing the rock I know, but it also doesn't discount that it was a Yowie. Paranormal activity aside for the moment, we must first gauge the entirety of the details of rock throwing at this site. Sometimes the rocks are small, at other times they are quite large - large enough to shake the footbridge the team is standing on. I think it might depend somewhat on what is to hand at the time. In the wooded sections and the car park, the available rocks are probably smaller, while at the creek crossing sections there is an abundance of larger rocks as seen in the footage of the numerous rock stacks. Just some thoughts there. This has been recorded numerous times, especially in the USA. 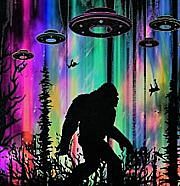 One that comes to mind is Christopher Noel and his interaction with the Sasquatch he calls "Music-man" for the drumming behaviour. He has video captures of green pine cones thrown very accurately and lobbed over several layers of trees and on-point enough to hit Christopher in the head. I have some reservations about this one. I haven't witnessed it myself but I have seen things fall vertically out of rainforest trees all the time. It seems natural to me rather than being a Yowie up a tree dropping it. If it had been thrown from a long distance it would still have an angle of trajectory that was noticeably not vertical. I am not discounting this particular team's experience, I just don't have enough information on this and have not experienced it myself. I don't see how this one is significant. It is quite likely and somewhat to be expected since the critters keep a good 20 metres away from you at all times through layers of rainforest vegetation. Ron has also reiterated that you can hear the rocks coming through these layers. That sort of resistance reduces projectile speed in a normal manner and I would not expect small projectiles to cause much harm unless they get you in the eye. Watch out for the larger ones though. I can see how you clued into poltergeist activity though, especially with some of Dee's descriptions of the touching and unseen presence felt. There is an interesting cross-over in phenomenon between the spiritual and the physical that shows up with many fringe phenomena and Yowies is only one of those. a. The physical is verifiable by current methodologies. b. The spiritual is currently not scientifically verifiable beyond elimination of known alternate explanations. c. I can't rule out the possibility of both the physical and spiritual aspects being valid yet perhaps not from the same cause. In the back of my mind is the possibility of a number of different physical phenomena being hijacked by the same spiritual causality. So perhaps it is not a case of being an either/or situation. d. I also think that if I persist investigating the physical side, whatever spiritual manifestation might be associated will eventually also reveal itself. If it doesn't then I still have the progress made studying the physical trace evidence. It's an interesting conundrum I admit. Good luck with your bush trip. I agree with much of what you say Trevor, but hasten to add there are plenty of reports of people seeing them throw rocks (among other things). Apparently they throw them sort of underarm in a sideways motion... which makes sense when you consider their thumbs are not as opposable as humans. As to talking to them as you enter their country, I've seen plenty of elders (Origines, not the Old Fellas) on documentaries 'ask' permission in their tribal tongue. Remember these animals have evolved over a very long time without technology of any sort, hence I would suggest the possibility of their thought system (brains) evolving along slightly divergent, from humans, paths... which could result in a more 'telepathic'/intuitive brain structure. There is plenty of scientific evidence supporting limited 'telepathic'/intuitive abilities even in numbed-out-to-their-surroundings humans, so who is to say the Old Fellas canNOT 'mindspeak'? ... or at minimum be very comprehending of tone, body language, etc of the 'researcher' asking permission to enter the area? well said Trevor, as for going into the area in question we may go once a month if that as we have some other areas we are exploring with good results. Interesting you mentioned poltergeist activity, i have never seen the hairy man throw any rocks, its like there invisible out there. 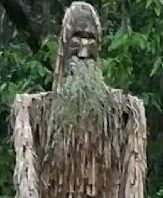 The only thing (other then eyeshine) i have seen was a very large white/grey figure gliding across the path in front of us--so that is quite paranormal, yowie or poltergeist, i have no idea. In saying that Ron had seen a hairy body jump from a tree (which was knocked down one day). The one I saw was a light tan colour I only looked up as it snapped a fair sized branch. Dee and myself both saw the large white one as she said it was like it glided across the track. And they were not pebbles it was throwing they were fair sized rocks to avert our attention while it crossed the track. Wolf wrote: The area is certainly an excellent habitat for these animals. Plenty of water and I reckon the dam would have more than enough tucker around its edges in the form of fresh water mussels, fish, yabbies and lilies. Hi Wolf, i think you have it wrong, they have only been aggresive on a couple of occasions, every other time they are extremely welcoming, they call us in and simply play with us with the rocks, they are just saying "We are here". They love our company most of the time. They wont resort to more aggresive behaviour because we leave when we know. Honestly you get that GET OUT feeling and we go. The small pebble throwing now is only directed at a new person we take out. Whatever it is out there is extremely smart , paranormal somehow, and actually loves attention. I am still afraid, but i know we will never be harmed. This was my comment and I believe the best answer to most of these questions is that the Yowie is much closer to you than you think you just cannot see them. There may be a reason why Paul Cropper and Tony Healy wrote the book "The Yowie: In Search of Australia's Bigfoot". Then followed up with another book "Australian Poltergeist: The Stone-throwing Spook of Humpty Doo and Many Other Cases". Maybe message Dean and ask him to edit out any specifics? Dion wrote: There may be a reason why Paul Cropper and Tony Healy wrote the book "The Yowie: In Search of Australia's Bigfoot". There is a two hour talk with Paul Cropper about yowies and poltergeist at " strange encounters" channel on youtube. That Australian Poltergeist book has some full on stories in there. The Authors experienced some of the activity themselves. They do mention the similarities between yowie and poltergeist. A few of the stone throwing incidents are in deep bush too which could be yowie related i suppose. Yowie bait wrote: There is a two hour talk with Paul Cropper about yowies and poltergeist at " strange encounters" channel on youtube. That Australian Poltergeist book has some full on stories in there. The Authors experienced some of the activity themselves. Thanks Yowie bait, I will have to chase that up and listen when I have some spare time. Hi their , I'm heading up that way with a mate this weekend . What's the name of the road it's off .cheers. Here is an interesting article from TROVE discussing an ancient tribal war in the region. Could the stone throwers have a paranormal origin? river are the ranges of D'Aguilar. man hears the same unaccountable sounds. successful leader he proved himself. a week's work he succeeded, in doing. became coagulated and sank to the bottom. only "the older warriors understood. Well well here i go again for the winter, hope they remember us. Finally got my hours down at work and after all this time got my nerves back. PM me if anyone wants to head back out with us. GET READY RON ! Hey Dee, give us a txt msg if you head out again It's been awhile! hi. I mostly lurk in this forum and don't post much. mostly out of respect with keeping the high degree of quality on what is in my mind one of the best forums, member and content wise, on this subject out there. in regards to rock throwing and their high degree of finesse, particularly with accuracy and impact ballistics, I have a modest hypothesis. it's easy to conclude that yowie and sasquatch utilise rock throwing as a weapon, likely for hunting purposes. high degrees of accuracy would obviously be necessary. i imagine them training while young up until adulthood by using tree trunks, stumps and other objects as target practice for preperation in hunting small game. however, that doesn't necessarily explain how they throw rocks without hurting the target. In order to address that I propose that it's not anything paranormal, but that they play simple games akin to "rock tag" with each other as adolescents. besides serving as entertainment for the young ones it could teach them how to lead their shots and hit elusive targets which I expect small spooked game to often be. they learn to "pull" their shots so that the rock doesn't actually hurt their siblings upon impact. getting adroit with that type of skill and controlling the severity of the impact could be a necessity in mastering the art of hunting with rocks. having fine control over your tool is the standard with any sort of weapon training. it's not the discharge of the weapon but the control of it that's most important. I suspect rock throwing to be no different in that regard. it's possible they may moderate the impact force to incapacitate prey without spooking the rest of the flock it's in the company of, in case they are looking to get more than one kill. kinda like a silenced rifle report is less likely to spook a herd than a unmitigated one. unfortunately, I only can offer conjecture. all my experience with these creatures has been from a single instance in the sierras of California from a few years back where a friend and I were driven off a fishing pond at alpine attitudes by what we suspect were the repetitive roars of an alpha male. we never saw it but we sure heard it as it closed in on our location, and it was deliberately trying to be intimidating (and it was very much so) with its attempt to drive us off its likely food source at that altitude. I could go into detail if asked but it's sorta off topic for this specific thread. Feel free to start a new thread bassplyr if you wish The sierras of California (although never been) are beautiful. Have you listened to any off the roars or howls on the internet, and do you have a comparison for us? Once heard a Howl in the Blue Mountains here that sounded very similar to one that can be found on the BFRO website.